After the FileCatalyst Server has been installed you may want to use an object storage mount as a primary or alternative storage device. The FileCatalyst Server currently supports Amazon S3 Buckets, Azure Blob Storage, OpenStack Swift3 or SMB/CIFS storage mounts. You can use this article to add the object storage to your FileCatalyst Server deployment. FileCatalyst Server v3.7 and newer. There are two methods to add Amazon S3 Buckets, Azure Blob Storage, OpenStack Swift3 or SMB/CIFS mount points on the FileCatalyst Server. You will need to enable the Advanced view to see the File Systems tab. Adding object storage mounts as External File Systems. Using this method will only allow you to use one instance of each object storage available (Amazon S3 Buckets, Azure Blob Storage, OpenStack Swift3 or SMB/CIFS). For example, you will not be able to mount 2 two Amazon S3 Buckets. If you already have one Amazon S3 Bucket the option will disappear when trying to add another one. If you have a requirement to use multiple object storage points of the same type please see the URL Composition Method. 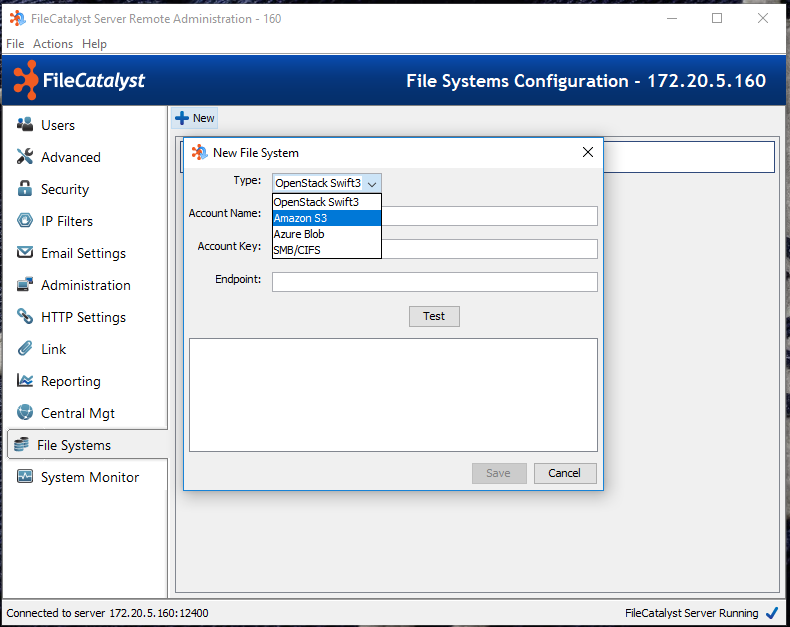 In the FileCatalyst Server Remote Admin navigate to File System tab on the left and click +New. From the drop-down list select the type of object storage you would like to add. 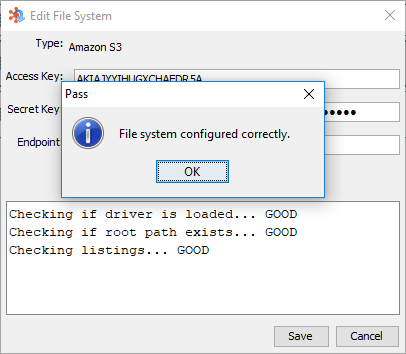 Enter your File System Access Key, Secret Key and Endpoint path. Hit the Test button to connect to the object storage. You will not be able to configure the object storage as the Users Home Directory, Virtual File or as a Virtual Folder. The alternative method is to configure the object storage using the URL Composition method. This allows you to use more than one object storage type. You can use the URL Syntax and add it as a Users Home Directory, Virtual Folder or Virtual File. For special notes, limitations and other configurations please see our External File Systems Document.